Character Creator (CC) is an amazing add-on tool for iClone that can create realistic looking, animation-ready 3D human characters for use with iClone and other 3D tools. Unique character designs are created through the use of shape morphs, customizable high-resolution skin textures, and outfits with clothing containing your own fabric designs. What do you need when generating characters Appearance, Skin, Clothes, Hair, Accessories? Well, they all can now be found in this amazing tool with drag-and-drop presets, in well-organized categories for you to generate various character styles in no time at all. Moreover, you can manually do further modifications with the use of sliders to create characters with more sophisticated details. The intuitive dockable UI design brings you the most flexible editing environment. The brand new, authentic one-mesh CC 3D Characters are designed for versatile body morphs. Besides applying basic figure shapes from the preset library you may also further adjust the body, or individual parts such as: Head, Torso, Chest, Waist, Arm, Hand, Leg and Foot. To easily create unlimited authentic human faces, you can either directly apply any of the presets for quick prototypes, or you can further refine the appearance through highly detailed facial sliders, grouped into intuitive segments such as: Skull, Forehead, Eye/Eyelash, Brow, Ear, Nose, Cheek, Jaw, Teeth and Mouth. Freely apply different texture patterns to your own masked area. Blend color variations and skin pores and wrinkles to generate the right skin for characters with various ages, genders and ethnicities. The full body Aging Morphs and Skin Normals options, give you the power to easily transform your characters into elderly ones. This can be applied to different genders and body shapes. Gracefully age your characters look or go all out and instantly turn them into seniors by adjusting the slider control. Import decals (tattoos) and move or resize them on top of the skin as you like. You can also use a mask layer (suntan) combined with the sun tan sliders to simulate natural summer tan lines, a sporty-beach look, or sunburn effects. Character Creator has integrated a complete make-up system based on professional cosmetic theories. Design the best brows for your characters face shape with eyeliners that fit her/his eyes. Apply eye shadows or add a shimmery eye effect to create luminizing eyelids. Add blush to enhance contour, or change lipstick colors and specularity to create a lubricated appearance. Additionally, you may manually define the area of any make-up to apply true-to-life finishes. Easily get your 3D character dressed in full outfits by layer-applying the underwear, upper clothes, lower pants/skirts, and outer garments. The best part of the design is that the same clothes can be conformed to different body shapes, and you may further refine the result using the conforming tool. Use an RGB mask to define preferred cloth or shoes segments. Make your own unique outfit designs for 3D characters by changing each segments color, pattern or fabric. Freely apply a worn-out effect or add dirt and dust, or add torn patterns to give jeans a variety authentic styles. Import your own decals made with Diffuse, Specular and Normal maps. Then imprint these logos over fabrics, or paste, weave and stitch patches and plastic stickers anywhere you wish. Requirements: (64 bit only): Win 7 SP1 / Win 8 / Win 10. 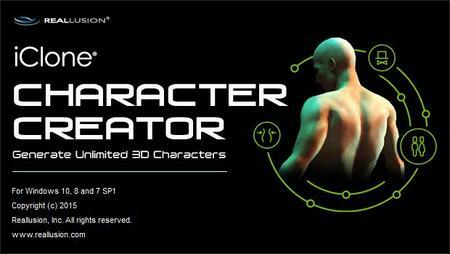 Reallusion Character Creator 2.2.2314.1 (x64) rapidshare mediafire megaupload hotfile download, Reallusion Character Creator 2.2.2314.1 (x64) torrent emule download, Reallusion Character Creator 2.2.2314.1 (x64) full free download, Reallusion Character Creator 2.2.2314.1 (x64) rar zip password or anything related.